Heat oven to 350°F. Spray 11x7-inch (2-quart) glass baking dish with cooking spray. Stuff chiles with cheese strips; arrange in baking dish. Sprinkle with pimientos. In medium bowl, beat egg yolks and milk with wire whisk until well blended. Stir in flour and salt until smooth. In large bowl, beat egg whites with electric mixer on high speed until stiff peaks form. Gently fold yolk mixture into beaten egg whites until no traces of white remain. Spoon mixture evenly over stuffed chiles. Bake 30 to 40 minutes or until knife inserted in center comes out clean and top is golden brown. Garnish each serving with cilantro sprig. Serve immediately with salsa. 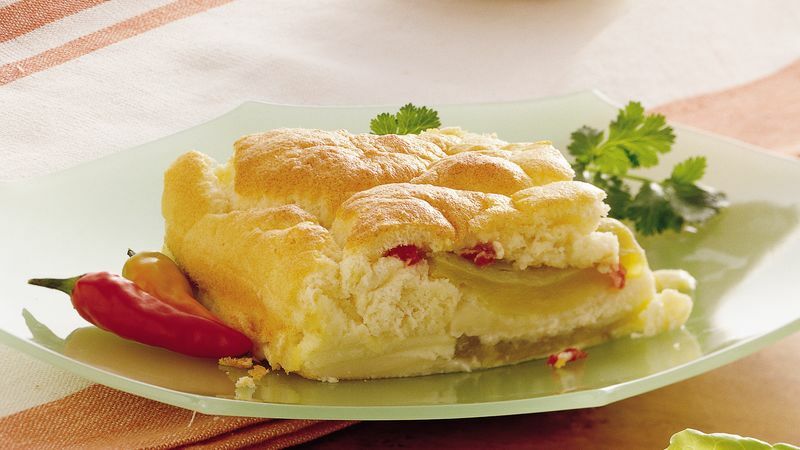 "CHEE-lehs rreh-YEH-nohs" is a Mexican specialty of cheese-stuffed mild green chiles and an egg batter that is fried until crisp and the cheese is melted. Our version is baked. Egg whites may stand safely at room temperature for up to 30 minutes. Room temperature whites will beat up fluffier.